The focus of template number twelve is on the job position titles and the degrees you received from school, this design has a functional layout. If your main asset is your past experience or skill set this might be the style you need. There are two basic resume types, a Functional resume and a Chronological resume. The differences between the two is better explained on our Resume Types page. A brief description of a Functional resume is puts your job experience and skills above education and consistent employment dates. If you are deficient in both of these areas you may want to explore using a template like this one. Additional fine-tuning can be accomplished by adjusting the Section Sorting to a more optimal setting. It you have problems in your career history that you would like to find some solutions for, please visit our Career Help and Tips Library. We have numerous articles that address specific problems such as these. Concealing a weak educational history can be attempted by using a combination of writing and formatting strategies. With proper style selection your resume has the possibility of being much more effective than writing it alone. Of course with enough digging any unfavorable facts can be uncovered, but you also don't need to go out of your way to expose them. 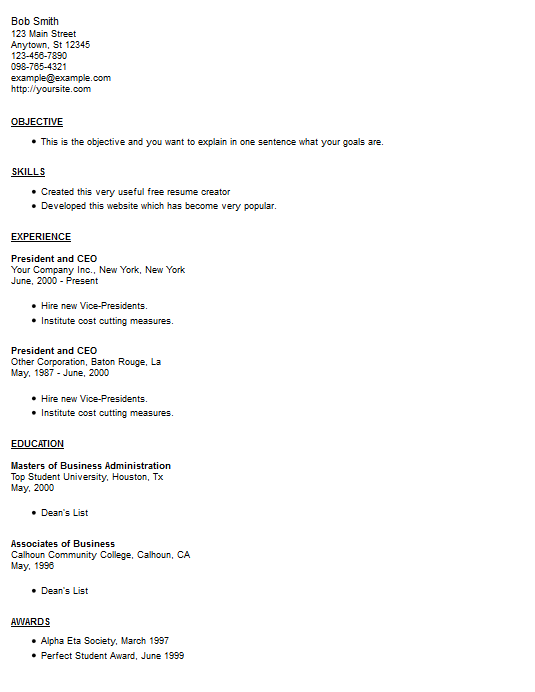 Access this template from our resume creator program.